WMG, formerly Warwick Manufacturing Group at the University of Warwick, is using Dymola modelling technology to help develop the next generation of low carbon vehicles. The programme, part of the £29 million West Midlands-based Low Carbon Vehicle Technology Project (LCVTP), is an advanced research project which will ensure Britain’s leading role in shaping the future of passenger transport. WMG and partners Jaguar Land Rover, Tata Motors European Technical Centre, Zytek, Ricardo, MIRA and Coventry University, have created 15 separate workstreams covering everything from battery cells to aerodynamics. WMG is leading the development of the overall plant models, concentrating on powertrain technologies, the group of components that generates power and delivers it to the road surface. Dymola is a world leading multi-domain modelling and simulation tool. It enables engineers to visualise a joined up, seamless understanding of vehicle architecture and dynamics, and allows them to simulate everything from control system design to driveability. This enables the teams to investigate and optimise every component before physically building a vehicle, drastically reducing time to market. 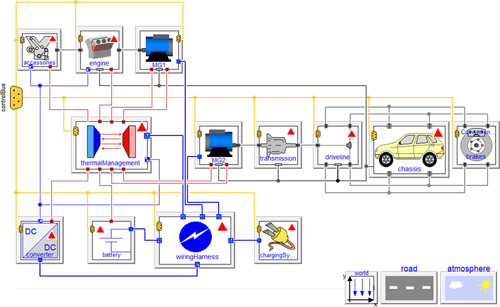 Dymola is being used alongside WARPSTAR (WARwick Powertrain Simulation Tool for ARchitectures), a flexible tool developed by WMG and its partners using the MATLAB/Simulink® modelling environment. A low carbon future requires a fundamental reassessment of how companies approach vehicle engineering – from advanced battery and motor technology for efficient propulsion, light weight materials and aerodynamics to minimize lost energy, through to intelligent control systems for efficient operation in urban environments. The low carbon agenda has for the first time in decades changed the rules of engagement in the auto industry. The need for completely new components, sourced from new partners and assembled into new modules, is forging new alliances. The LCVTP is set to place the West Midlands as the primary source of low carbon technology for the global marketplace. The initiative has been made possible through a £19 million investment (£9.5million funding from regional development agency Advantage West Midlands and £9.5 million from the European Regional Development Fund Programme (ERDF)); and a further £10 million contribution from the industry partners involved. The project should be a significant job creator in the UK by 2020, with the majority in the West Midlands. It will also safeguard jobs in the supply chain as businesses switch to low carbon opportunities. The LCVTP brings Advantage West Midlands’ investment in low carbon vehicle initiatives to £41.2million. The agency has already invested more than £22million in a range of low carbon vehicle projects.